“I’m the kind of guy who always wears navy jackets with pretty much everything. Now I have gotten a chocolate brown Zegna jacket and a mid grey DB from YSL. Could please advice me which colour and type of trousers to wear with those? I personally find it very hard. I recently received the above question from a reader of my blog. Choosing separates can be a tricky business. It’s no wonder that most men stick resolutely to suits, the most reliable of ensembles and it’s no surprise that when we choose to introduce a little more variety into our life, we cling to the tested and tried; navy blue blazers. I am an evangelical promoter of variety and colour in clothing and so I applaud any attempt to explore beyond the mundane or the traditional, although I understand the caution of those who avoid mixing and matching due to the difficulties highlighted by our commentator. I rather enjoy the process, as colour and texture matching is one of the most creative aspects of dressing and the results, though variable, can be very appealing indeed. Chocolate brown is a beautiful colour to work into an ensemble and there are a number of options for the trousers in terms of colour and texture; it all depends on the type of material of the jacket. If it is an ‘orphan’ – part of a suit – the trouser texture and colour should contrast completely. A cotton drill is an excellent option, provided the jacket is not made of too thin a material. Colours that would work in this regard range from a subtle mid-blue to a strong mustard. If the jacket is – or at least appears to be – very much a blazer, a mid to light grey wool flannel would be perfect. When brown and grey combine, they can produce one of the finest marriages of colour in the sartorial world. If the jacket is more of a summer jacket – perhaps a linen or cotton – a pair of cotton khakis would be perfect. 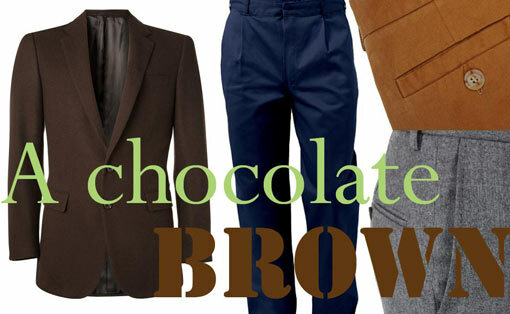 Another option, for a more adventurous man looking to ape the Milanese look, a pair of white trousers would complement the chocolate brown very well. The mid-grey double breasted jacket is a little more tricky, not least because double-breasted suit jackets often look ‘lost’ when parted from the trousers. Mid-grey is a more formal colour than chocolate brown and is less forgiven when used as a separate. One option is to affect the ‘stroller’ look and pair it with black and white houndstooth trousers. However, a mid-grey double breasted blazer would also look very fine with a pair of creamy white cotton drill trousers in the summer months (or winter, should you dare) but other traditional colours like navy blue can make the look a little awkward. Mid-blue on the other hand is a much better foil for mid-grey. Unusual colours such as a rich brown – another grey/brown combination – would look good in cotton but linen trousers should be avoided as the structured formality of a double-breasted mid-grey jacket would clash. I just love the term “chocolate brown” as it implies that it is edible. Nice post. May I also suggest with the chocolate brown jacket, a pale blue shirt, ecru chinos, navy pocket square with white dots and brown shoes of your choice – I go for deck shoes if it’s summer or brown desert boots if it’s not so warm. Your readers may prefer loafers. Good article and made me consider an article of clothing I might not have looked at before. I just bought a nice pair of brown dress pants and a waistcoat. The thing I love about brown is that it adds warmth to an outfit without having to go full on color. I’m a big supporter of color by the way but sometimes I just feel like enjoying some earth tones. Plus, it’s versatile. You can pair it with black shoes, shirt and a white oxford, you can lighten it up with colors, pocket squares of all kind will pop against brown. Brown works great with dark denim. Great color and great write up.